In his first meet since returning from a two-week absence due to academic issues, Chase Kalisz won three events for the Bulldogs as the Georgia men and women swept the visiting Volunteers, with the men winning 161.5 to 135.5, and the Melanie Margalis-led women topping Tennessee 177.5 to 114.5. The Bulldogs started off quickly, winning the first seven events of the meet to put the Volunteers in an early hole, including victories by tight margins in both 200 medley relays. With a quick 24.92 leadoff leg from Olivia Smoliga, the Georgia women edged the Volunteers, the defending NCAA champions in this event, 1:38.39 to 1:38.74. Tennessee returns three of the four legs from that relay a year ago, including backstroker Lauren Solernou, who, after missing over a month earlier in the season, returned to competition two weeks ago against Virginia Tech. The difference-maker on the men’s side was Nic Fink, who out-split Tennessee’s Renato Prono by over a half-second to give Georgia the lead they needed, touching with a final time of 1:28.09. Following the relays the Georgia women got an impressive from sophomore Brittany MacLean, who captured the 1000 freestyle in an NCAA-leading 9:36.85, and returned to the pool less than 15 minutes later to win the 200 free in 1:46.93. Tennessee freestyle star Lindsay Gendron, one of the breakout swimmers of 2013, was second in both events, finishing with final times of 9:43.45 (just edging teammate Amber McDermott, who finished 9:43.52) and 1:47.01. McDermott would later edge MacLean in the 500 free for the win, 4:46.56 to 4:46.67. The Bulldogs got wins in both events on the men’s side, as well, with Andrew Gemmell (9:10.69) leading a 1-2-3 finish in the 1000 free, and Matias Koski taking the 200 free in 1:38.54. Koski would later lead another Georgia 1-2-3 in the 500 freestyle (4:29.17). Garrett Powell grabbed second place finishes in both events. Georgia would go on to win the next eight events on the women’s side, with Margalis taking the 100 breast in 59.82, the third-fastest dual meet performance of the year (only Breeja Larson has been faster) and 200 back in 1:55.56. The Bulldogs also got victories in that stretch run from Smoliga, who took the 100 back in 54.13 just ahead of Solernou (54.57), Hali Flickinger in the 200 fly (1:58.51), Madeline Locus in the 50 free (22.67, out-touching Tennessee’s Faith Johnson by a tenth), and Shannon Vreeland in the 100 free (50.04). Lauren Harrington (100 fly, 53.80) and Nicole Vernon (400 IM, 4:12.98) also got individual wins for the Bulldogs. Tennessee posted the top time in just one event on the afternoon: the 200 breaststroke, where Molly Hannis touched in 2:11.92. The men’s meet proved to be a much more even affair overall, with Tennessee’s Luke Percy and Sean Lehane each winning a pair of events to counter Kalisz’s three individual titles for the Bulldogs. Percy, a first-year Volunteer from Australia and one of the fastest junior sprinters in history, took the 50 and 100 freestyles, touching in 20.25 and 44.10. Notably, Percy would also later lead off the winning Tennessee 400 free relay in 43.79. Lehane captured both backstroke events, out-touching Taylor Dale to win the 100, 48.15 to 48.16, and later running away with the 200 in 1:44.09. However, Georgia’s prowess in the distance and butterfly events proved to be too much to overcome. Kalisz, one of the best and most versatile dual meet swimmers in the country, led a 1-2-3 Bulldog finish in the 200 fly (1:46.13), and 1-2 finishes in the 200 breaststroke (1:58.87, with Nic Fink grabbing second in 1:59.37) and 400 IM (3:49.65, with Ty Stewart touching second in 3:54.21). 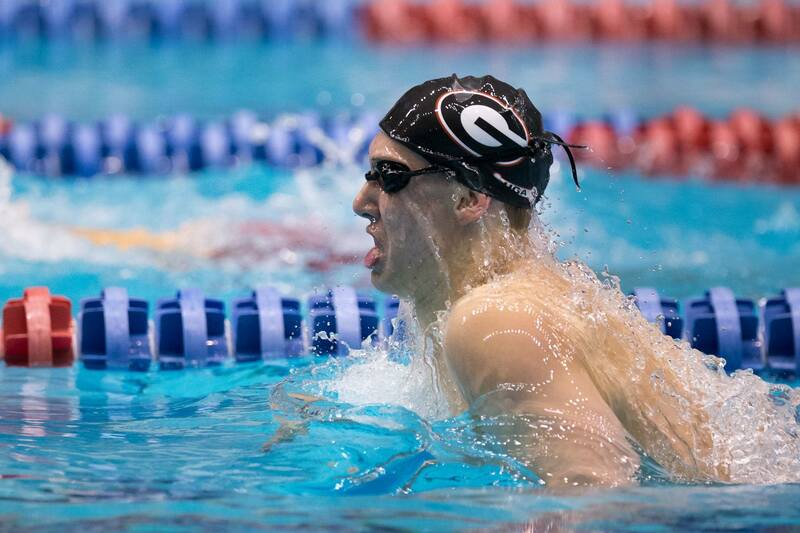 Fink (100 breast, 54.59) and Pace Clark (100 fly, 48.54) also had wins for Georgia. The Bulldogs finished things off on the women’s side with an impressive 1-2 finish in the 400 free relay, with Vreeland (50.29), Margalis (49.40), Locus (50.16), and Smoliga (51.62) taking the win in 3:21.47, and Jessica Graber (50.92), Harrington (51.14), Van Landeghem (50.61), and Anna Kolanowski (51.33) finishing second in 3:24.00. Notably, although head coach Jack Bauerle is still suspended, he earned credit for his wins today, bringing his career total to 503 over his nearly forty years as head coach. The Bulldogs finish off their dual meet season next Saturday when they play host to Alabama. Tennessee will host the Florida Gators next Saturday in their final meet of the season. Another impressive triple for Mr Kalisz. 200 fly/200 breast/400 IM in the same evening! Good to see Chase back in action. If Jack’s still suspended, are his issues not tied to Chases’s eligibility?. Jack’s beloved in the swimming world for good reason, hope everything gets gets cleared up soon. Really great testimony to the power & spirit of the whole team both the women & the men how they continue to dominate in the face of adversity! A lot of teams would be faltering at this stage I’m looking at you Arizona from this weekend but UGA just continues to impress with their wins and fast times! Can’t say enough about Brittany’s NCAA-leading 9:36.85 especially as she went immediately afterwards to win the 200 Free in a faster time than NCAA-leading Franklin’s time from Friday. Same with Amber’s 500 Free which topped Franklin’s times against the 2 Arizona colleges this weekend. Kudos to Chase and everyone in the team as well. GO DAWGS!!!! You are the king or queen, I don’t know, of the provocation! Do you seriously think that, because Brittany McLean and Amber McDermott have swum faster times than Missy Franklin this weekend, it means they will beat her at the NCAA championships? I’m sure you know too well swimming to think that. I see a pure provocation to launch another debate with the Cal fans. But if that’s what you sincerely think, then you will be very disappointed. Because Missy will finish well ahead of your Georgia swimmers in the 200 free and in the 500 free. Why do you always compare the Georgia times to the Cal times?